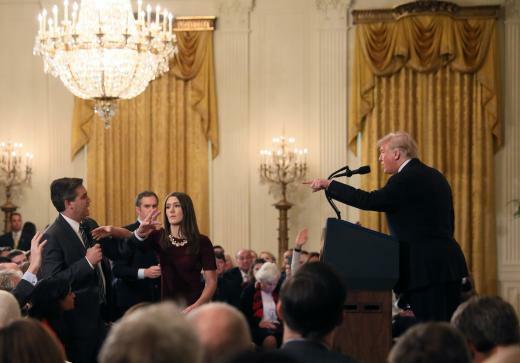 White House suspends CNN reporter after verbal duel with Trump - SABC News - Breaking news, special reports, world, business, sport coverage of all South African current events. Africa's news leader. A White House staff member reaches for the microphone held by CNN's Jim Acosta as he questions U.S. President Donald Trump during a news conference following Tuesday's midterm U.S. congressional elections at the White House in Washington, U.S., November 7, 2018. The heated exchange began after Acosta clung to the microphone and persisted with questions about the president’s repeated and angry denunciation of a caravan of poor Central American migrants making their way through Mexico to the US border. He asked Trump why he has characterized it as an invasion. In a later tweet, Sanders said the White House stood by its decision. “We will not tolerate the inappropriate behavior clearly documented in this video,” she wrote. This entry was posted on 08 Nov 2018,10:59AM at 10:59 AM and is filed under World, Homepage Featured Story Slider. You can follow any responses to this entry through the RSS 2.0 feed. Both comments and pings are currently closed.